A Devon farming family has unveiled a maze in a 10-acre field of maize to mark the 100th anniversary of the scouting movement. 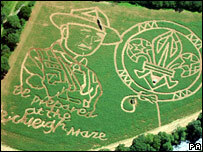 Nick Lees and his family have created an image of the movement's founder Robert Baden-Powell in the corn. The maze, which is open to the public, has been created in a field at Bickleigh, near Tiverton. It has been designed by Mr Lees' daughter Katie, 22, and took days to mark out and create with maize plants. Mr Lee's wife Janice said at the moment the maize was only waist-high, but it was expected to grow to about 15ft. Over the years, thousands of people have travelled to try out the other mazes created by the family in the field. They have marked the Queen's Golden Jubilee, the 200th anniversary of the Battle of Trafalgar in 2005, and last year the bicentenary of the birth of Victorian engineer Isambard Kingdom Brunel. Mrs Lee said the maze would be open until 9 September, then it would be harvested and fed to cattle.